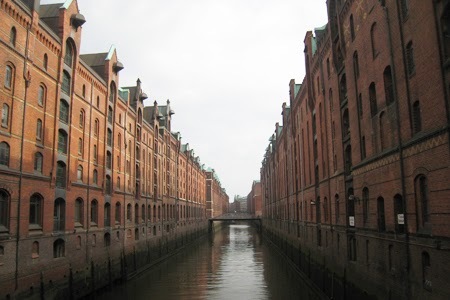 If you want to see waterside regeneration done well, go to Hamburg. If you want a masterclass in sustained and sustainable long term strategic planning, go to Hamburg. If you want to enjoy a really great city, go to Hamburg. There is so much to admire and delight in Germany’s second city, which likes to style itself Green and Blue because of its environmental credentials and since nearly half its area is water or green space. 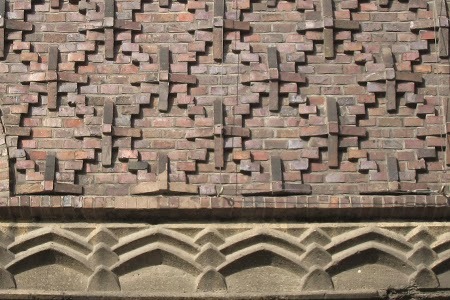 It could also be termed Red in recognition of its wonderful tradition of brick building. Hamburg has lots of lessons for Blighty but, because our economies and political systems are so very different, translating these lessons for Britain’s timid, obtuse, sclerotic planning and regeneration processes is going to be difficult. Hamburg with a population of 1.7 million is broadly equivalent to Greater Glasgow or Liverpool. 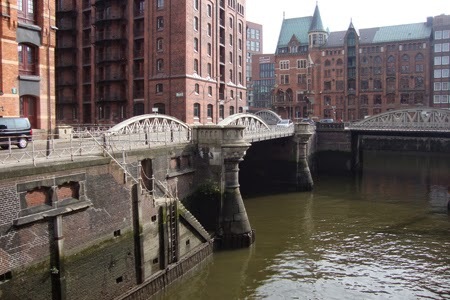 But unlike the politically emasculated and financially strapped British conurbations, Hamburg is a ‘Free and Hanseatic City’, incorporating its old rivals Altona and Harburg. It is actually a City State, one of the Federal Republic’s 16 states, so it has freedoms that British cities can’t even imagine any more. 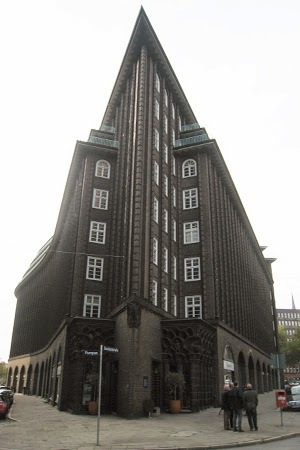 Like Glasgow and Liverpool, Hamburg’s heyday was the early C20, as can be seen in its magnificently grand architecture and engineering swagger. This was made possible by ruthless destruction of the old city, much of which had already been lost in the great fire of 1842. A century ago it was mocked as the ‘Free and Demolition City of Hamburg’, where merchants’ profit were all. Then in 1943 the city suffered catastrophic bombing and firestorms. So it is certainly not an ‘historic’ city but it has reinvented itself as a great city, although not avoiding the mistakes of so much post war reconstruction, especially massive roads and a fairly boring ‘downtown’. However it is an immensely liveable, lively and dynamic place which, like Berlin, confounds stereotypical ideas of German order. Port employs over 100,000 people – can you imagine!? 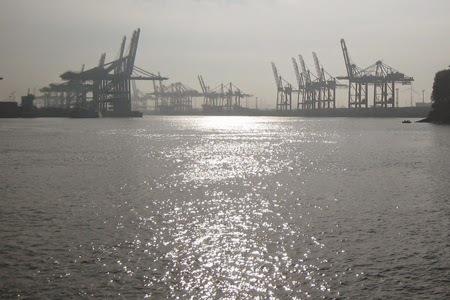 Hamburg, after Rotterdam and possibly Antwerp, is the largest port in Europe and the port area is vast – allegedly 30 times greater that Liverpool. Somewhat surprisingly it is 100 km from the sea along the immensely broad but relatively shallow Elbe. The development of super-large container ships is a threat to its supremacy, so there are controversial plans to dredge the river and yet more container berths are being constructed. But while planning a long term future for the port, which still accounts for 10% of employment, Hamburg is also diversifying its economy. And, as in so many cities, the redundant port next to old town (Aldstadt) would seem an obvious candidate for regeneration. 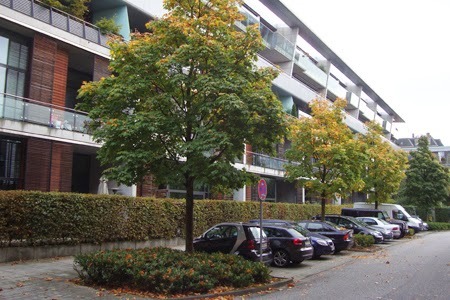 But Hamburg planned this quietly, so that the city could assemble the land at industrial values and only then announced the regeneration masterplan in 2000. So instead of, as in Britain, the plan being essentially marketing and promotion which, together with publically funded infrastructure, raises the value of private sector land, Hamburg captured the uplift in land values and can reinvest this in both infrastructure and quality of outcomes. Easy if you have a long term civic plan and the freedoms and finance to take this sort of initiative – if only. Lifeless waters though – what to do? 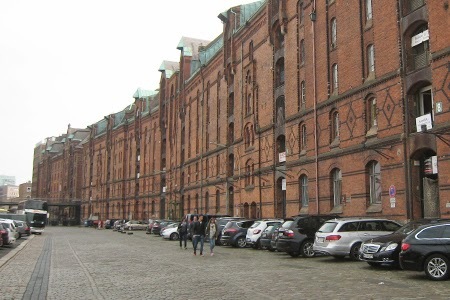 Between Aldstadt and the new HafenCity is the extraordinary Speicherstadt warehouse area, dating from the 1880s and quite amazing townscape. The tall, brick, Gothic warehouses line the canals forming a deliberate enclosure against the town, like, the Albert Dock but in a way more like Nottingham’s Lace Market with water. I particularly liked the last of the warehouses built around 1910, all stripped down and proto-modern. One warehouse has been converted to an excellent maritime museum and another houses a mind-blowingly extensive model train exhibition, but surprisingly most are still in use as warehouses, this being the epicentre of the Persian carpet trade. So they are not all ponced up as apartments, bars and restaurants as you might expect, which I liked, but they are now serviced by road, not water, and so the canals are lifeless except for the tourist boats, which is a pity. Juggernauts serving the warehouses apparently provide the justification for hideously wide roads: Am Sandtorkai and Brooktorkai, which divide Speicherstadt from HafenCity proper, although over-scaled roads are a ubiquitous Hamburg vice. This spoils your initial impression of HafenCity, especially as some of the earliest and more bombastic new buildings line these streets, like the Der Spiegel offices. Another issue is that, because of flood risk, the road is raised higher than the Speicherstadt warehouses, which tends to diminish them. The flood level also requires an upper network of walkways that bridge across the street. The HafenCity masterplan is certainly big, allegedly the largest waterside development in Europe and will represent a 40% increase in the CBD area with 2.3 million sq.m. of gross floorspace and an anticipated 45,000 jobs and 6,000 homes by 2025. 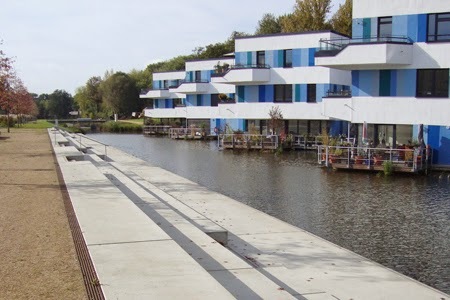 The masterplan is based on a competition winning concept by the Dutch and German team Kees Christiaanse/ASTOC. It is being delivered by a company wholly owned by the City and 80% of the development cost is funded by land sales. 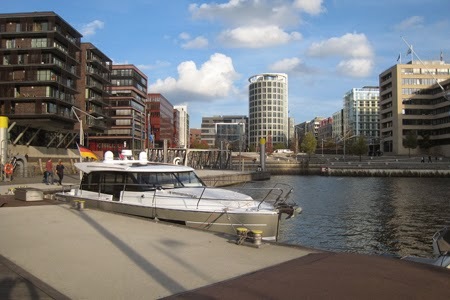 The old port itself was pretty much a tabula rasa – Hamburg does not have enclosed docks but there are a number of internal quays which have been retained. The mix of uses, volumes, density etc. for each plot is closely regulated by the plan and the design is chosen through competitions. 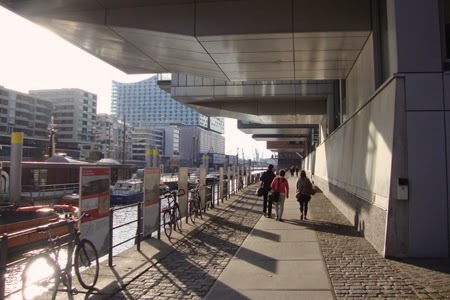 There will be 10km of waterside promenades and more than a third of HafenCity will be public open space. 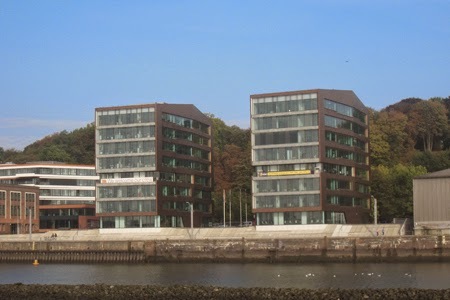 Since Hamburg owns the land it is able to choose developers based on the quality of their schemes and how well they fit with the masterplan, rather than accepting the highest offer. In the early phases of development land was disposed of in relatively small plots to a variety of developers, with strict enforceable timetables for development. 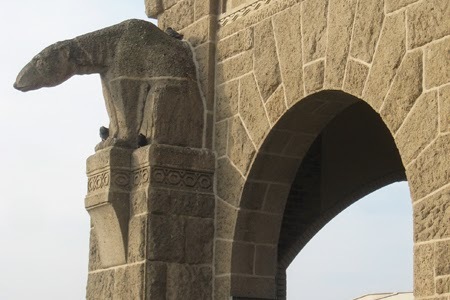 From a British perspective it is surprising, given these restrictions, that so much has been built out so quickly – the western part of the site is largely complete. The regeneration company says the system gives certainty and confidence to developers, and it does avoid the posturing and brinkmanship of so much planning and regeneration in Britain. However there remain big issues. 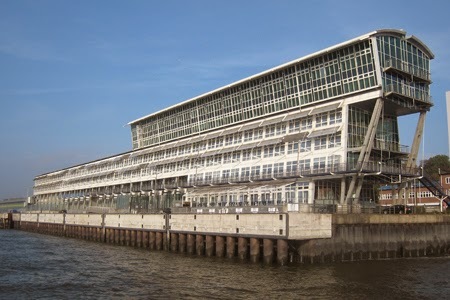 The central shopping complex and cruise liner terminal was contracted to one large developer, ING, and thus became a victim of the financial crisis. This key site remains vacant, and begs the question: was building a glitzy typical shopping centre only 800m from the city centre ever the right model? Another big issue is that although lots of flats have been built, none are for social housing and many are investment properties on the London model. There are big question marks too over plans for a high rise office quarter at Elbbrücken. 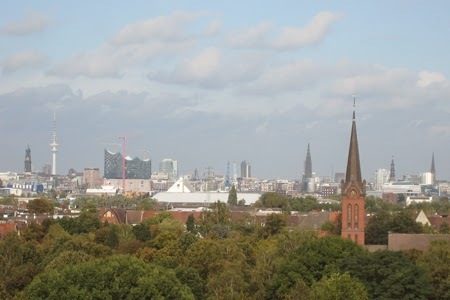 In Hamburg building heights are strictly controlled – nothing is allowed to compete with the church spires which dominate the skyline of the Aldstadt, a prospect similar to those familiar shots of Copenhagen in ‘The Killing’ – low blocks, Hanseatic church spires, sombre northern light, industrial chimneys and cranes in the distance. 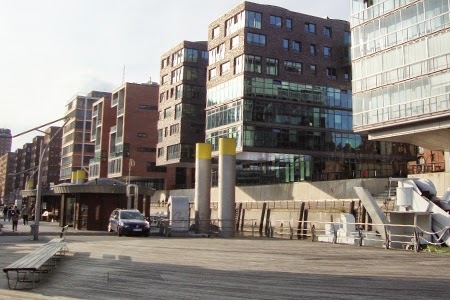 HafenCity is high density but the dominant block height is around 6 to 8 storeys. There are a few towers twice that height, like the expensive and largely empty apartments on the Elbe which look like a pile of concrete waffles. These are part of the signature Unilever HQ built around a public atrium. Designed by Behnisch Architekten it is has a wonky irregular shape with the elevations behind a sort bubblewrap. You can’t help but like it. 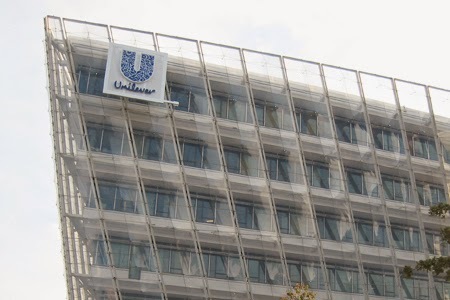 The masterplan is big on mixed use, seeking to integrate offices and housing, retail and services, as in the Unilever complex. There is a new primary school with rooftop playground. Ground floor uses are specified but the plan avoids the unrealistic mantra of always having ‘active ground floor uses’. Because buildings are raised against floods the quayside is often fronted by a basement car park. 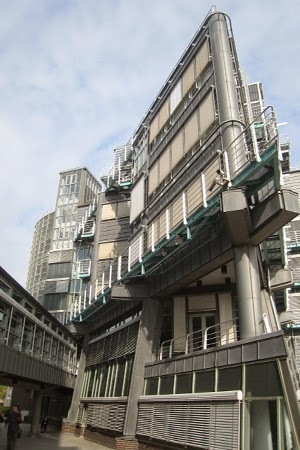 However interest is created by cantilevering buildings over the quayside walks, which can be quite dramatic. There is lots of hard landscaping and big flights of steps down to quays, named after famous navigators – Magellan, Vasco da Gama etc. An imaginative idea is to take a boardwalk through the middle of the inlet leading to the new concert hall, with exciting results. Soft landscaped areas and playgrounds provide relief from the sometimes relentless and exposed paved quaysides. The quality of design in the new build is undoubtedly good – far, far better than in British waterside equivalents. 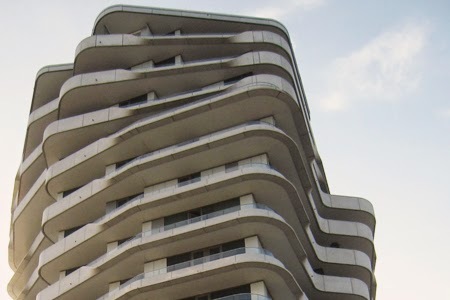 Many are thoughtful and inventive, like the white apartments by Love Architects with curved balconies and windows, evoking the sleekness of liners, or the adjacent block with continuous balconies and subtle variations of façade elements. Building heights feel right for the scale of the streets, spaces and water, except along Am Sandtorkai and Brooktorkai where the offices are too big, too bland and anonymous. But there is no real relationship between the new development and the traditions of port architecture – these buildings could be anywhere. In places the traditional street blocks dissolve into freestanding and competing pavilions. 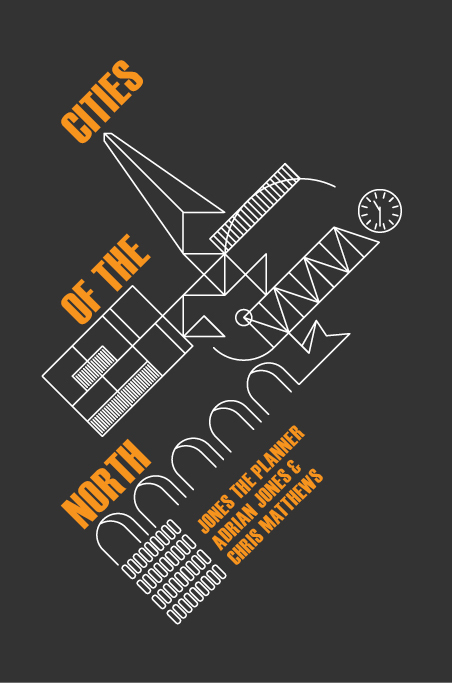 The masterplan has been criticised for its lack of ‘emotional input’, especially in the public spaces, which can seem clinical and bleak. 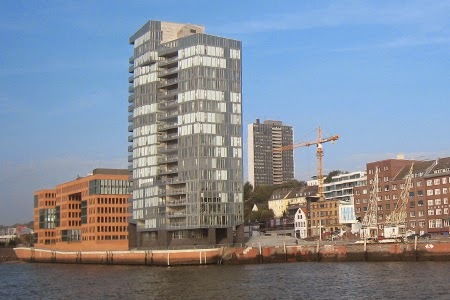 It feels like HafenCity lacks an overall character; the whole is less than the sum of the parts. 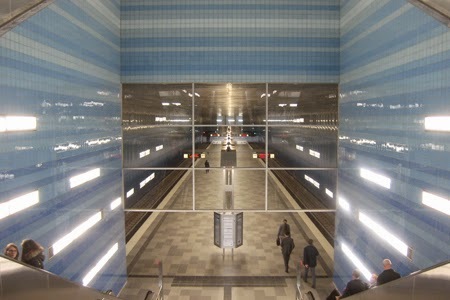 What could have animated HafenCity is the new U Bahn (U4). This being Germany, a metro link was planned from the start, despite HafenCity’s close proximity to the CBD. 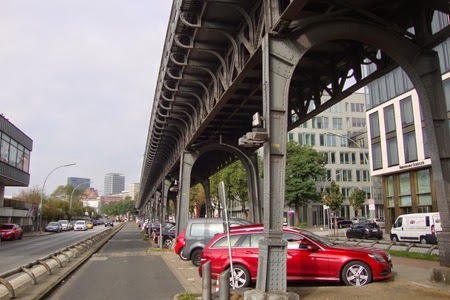 Hamburg’s architects argued for this to be an elevated line, like the U3 line which runs west along the harbour giving fabulous views. 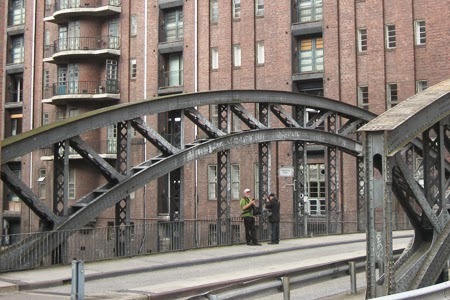 Or indeed Liverpool’s Overhead Railway, the ‘dockers’ umbrella’, sadly destroyed in the 50s. Unfortunately this imaginative idea was not taken up as a viaduct was considered ugly, wasteful of land and to impact negatively on values. Well actually the U3 engineering structures are magnificent, the land beneath is used very efficiently for parking and cycle lanes. 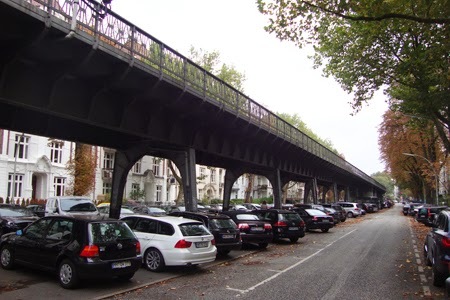 Elevated trains run through some of the most desirable fin-de-siècle housing areas in Hamburg, like Isestrasse, so I’m with the Hamburger Architekten. However you will arrive in HafenCity underground, to an admittedly fine station, but your approach will lack views, excitement and drama. What does add drama is Hertzog and De Meuron’s Elbphilharmonie. This crazy but wonderful project adds a glass concert hall with dramatic sails (or possibly wings) on top of a massive clinker brick Hamburg warehouse which stands on the apex of HafenCity facing the busy harbour. Still under wraps, the new concert hall rears out of the water like Lohengrin’s swan, as if pulling the warehouse along. It is staggering – staggering too in the costs (560m Euros) and delays and not mentioned much by official Hamburg. And, yes, there are arguments against such conspicuous cultural consumption, but it is a truly exceptional building and will become the symbol of the city, like Sydney Opera House. This is based on the impact it has from the ferry; imagine what it will be like inside. Efficient, well designed but a little lifeless; too much planning? 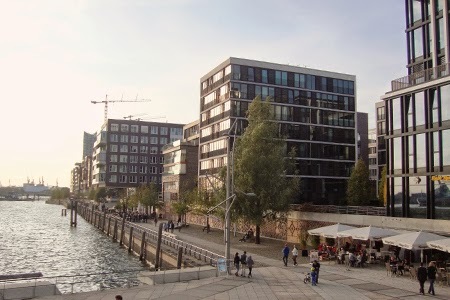 HafenCity has certainly got quite a lot of things right but you have to question how far it is really meeting its objectives like the promised fine grain and mixed communities. These seem to be ebbing away in a more difficult financial climate and the as yet undeveloped eastern districts are going to be harder to develop – further from the city centre and with a more hostile industrial context. The lack of social housing is a real failure but the plan for the next phases is for more social and student housing and to try and attract creative industries, which seems sensible. HafenCity really needs to develop a more complex morphology, a more particular identity and a genuine community and vitality. At night there are lots of visitors, but they are looking, not participating. This does not yet feel like a real city. 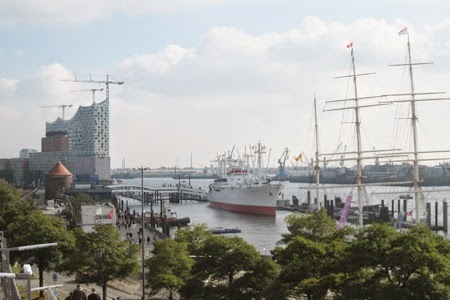 In addition to HafenCity there is much more waterside regeneration to see, stretching westwards along the Elbe from Baumwall past St Pauli with its famous Fish Auction Hall to the former fishing port at Altona. These are often striking new object buildings and sometimes dramatic conversions and extensions of old maritime kit. 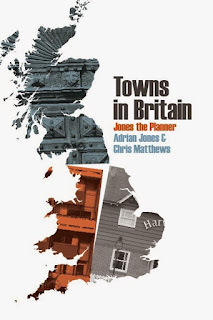 Together they provide a thin veneer to the lively older districts behind, so avoid the problem of having to create whole new quarters, character and identity. A good way to see them is from the No. 62 ferry. This takes you right around the harbour giving fabulous views of the port - an amazing assembly of cranes and containers stacked to the horizon. 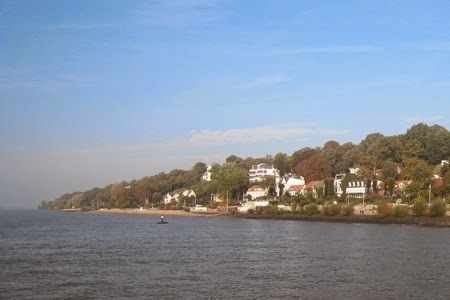 You also see well heeled riverside (almost seaside-like) suburbs like Neumühlen where the sea captains used to live. The ferries are part of Hamburg’s excellent public transport network, the first fully integrated system in the world when set up in 1965. Makes you very envious. The concept behind the new development of the fishing port was to create a ‘string of pearls’, and if not quite that they are mostly interesting and accomplished architecture. 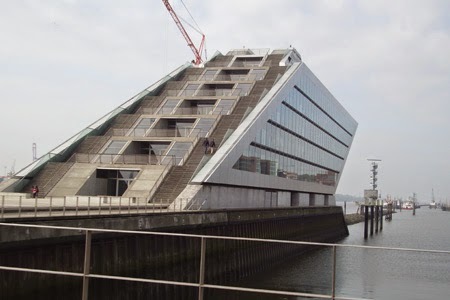 The Bürohaus Dockland by local firm Bothe Richter Teherani is the show-off building which definitely does get noticed, a trapezium sticking out into the water. You can walk up its sloping end elevation to a roof-top viewing terrace. The ‘string of pearls’ is impressive but the bulk of some of the new offices seems too much for the riverside context. Chipperfield’s new Empire Riverside Hotel by contrast is a well judged tall block with a well mannered narrow elevation to the river. Some of the most interesting stuff is conversions like the old cold storage plant stripped back to its essentials. There are grand C19th Hanseatic-style warehouses stacked high with additional glass storeys, such as English Heritage would baulk at. The old Harwich ferry terminal looks particularly wonderful, as does the Fish Auction Hall, but we did not partake of the famous 6am breakfast there. 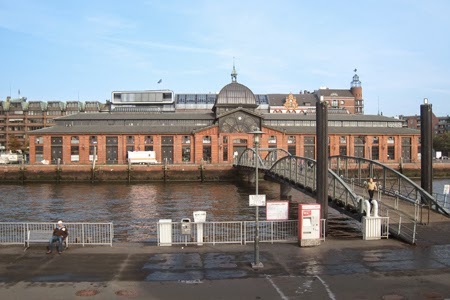 Landungsbrücken, the ferry and train station, in a Nordic Neo-Renaissance style is a fantastic location with all the bustle of the harbour and the elevated railway. The composition has unfortunately been compromised by crude additions. Near Baumwall station a new anti-flood promenade is under construction designed by Zaha Hadid with characteristic swooshes but unexpected restraint. 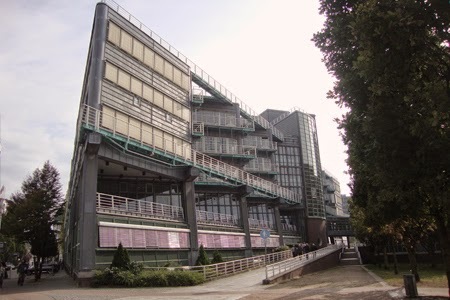 Behind this is one of the earliest and most remarkable regeneration waterside schemes – the Gruner + Jahr AG Publishers’ headquarters; publishing is one of Hamburg’s big industries. The (very successful) concept for this large complex designed by Kiessler and Partners in 1983-90 was to evoke the spirit of the old harbour infrastructure. The results are both appropriate and excitingly high-tech – you can’t help seeing the influence of Richard Rogers, otherwise unrepresented in the city. 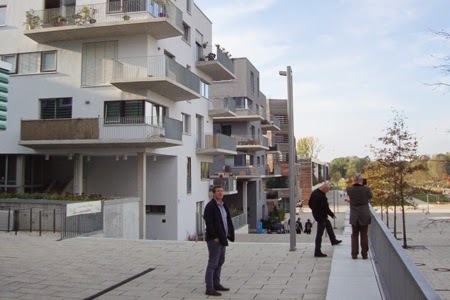 The German planning system is unlike Britain’s, with a very different dynamic between developers and planners. The basis is a sort of three dimensional ‘Town Map’ or zoning plan, with detailed specifications for new building initiatives, so it is the city taking the lead, not reacting to developer proposals. At times this can seem inflexible but it allows for a long term perspective. However planning does have to respond to public opinion, which in Hamburg has a distinctly green tinge that has frustrated various politically led developments. Unlike many German cities, Hamburg’s population is growing, and the present plan is to build 8,000 new houses a year, a third social housing, a third ‘affordable’ (definition unclear) and a third free market. 75% of houses are rented and, although there are rent controls, rents have increased significantly for new tenants. Because it is so difficult to build on green space, virtually all the new housing will be on brownfield land – what they call ‘more city within the city’, which is a nice way of explaining densification. This partly explains the strategy to ‘Leap across the Elbe’. 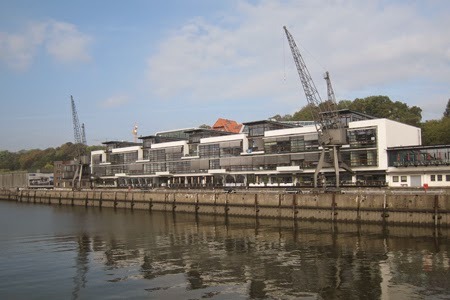 Hamburg proper is on the north bank of the Elbe, with the vast port area on a large island between river channels. Here too is Wilhelmsberg, a port workers’ community that became an immigrant area with lots of problems. 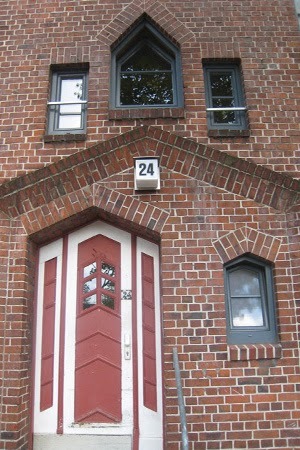 Hamburg is very stratified socially – the first question people ask apparently is ‘what is your address’? The strategy is focused on community empowerment and greening the area rather than physical regeneration. 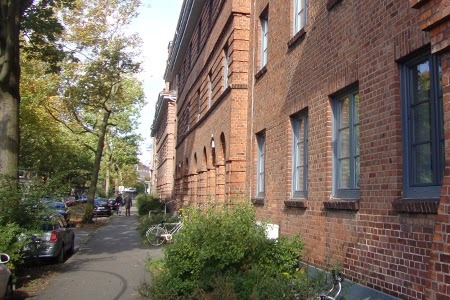 Hamburg has big green pretentions and was European Green Capital in 2011. An ambitious green energy strategy is being developed and voters recently decided to re-municipalise the energy grid, privatised in the 90s. 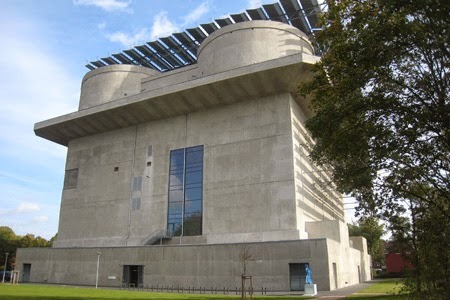 One of the most extraordinary sights is the Energy Bunker, one of several massive war time constructions around the port, where you can really appreciate Jonathan Meades’s thesis about the origins of Brutalism. It is now cloaked in photovoltaic panels and has a viewing gallery with a fine panorama across the city, from which you might see a new coal fired power station required by the Federal Government apparently, a reality behind the well intentioned rhetoric. 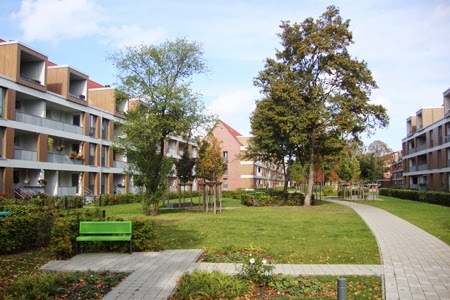 To test innovative, low energy housing an International Building Exhibition, IBA Hamburg, has been held in Wilhelmsberg, together with a Garden Festival. 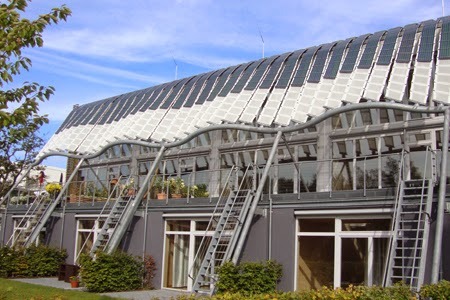 This includes slightly wacky stuff like BIQ House by Splitterwerk and Arup, with a bio-adaptive façade of algae tubes which provide solar shading and generate electricity. The algae can be harvested for biofuel. There are a dozen or so blocks of flats demonstrating different low energy technologies, including an attractive completely wooden construction. The city has now transformed the building exhibition into an urban development company. The ambition of Hamburg’s strategic planning is really impressive. Three kilometres of national autobahn leading from the Elbe Tunnel is to be decked over and made into allotments to tackle noise and severance (and partly to replace allotments being lost to housing). And in Wilhemsberg a major road is to be realigned along the railway corridor for similar reasons. New S and U Bahn lines are planned, new parks, wind farms and port expansion. However some policies in the Hamburg equivalent of a Core Strategy are as vague as the British variety - ‘zone for promoting dynamic development’ means what exactly? 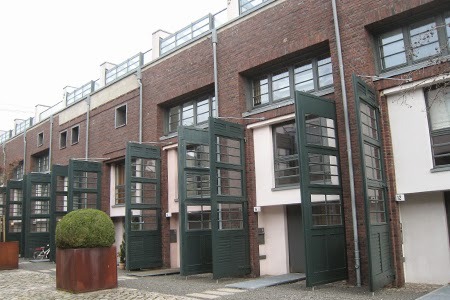 In older working class areas like Reiherstieg Viertel the official strategy is ‘gentle gentrification’. 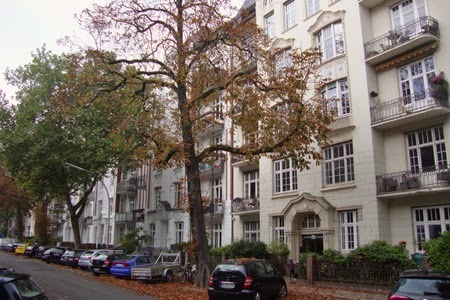 A lot of the housing from Jugendstil-influenced apartments and shops to Expressionist social housing is really very attractive and the area is genuinely ‘vibrant’ but the community is still mixed. What is really good too is the quality of new housing, simple and unassuming, not trying to be noticed (like some of the IBA examples), just well designed and well proportioned with generously laid out open space. Across the city in the Hoheluft district is a very interesting redevelopment of a former bus garage. 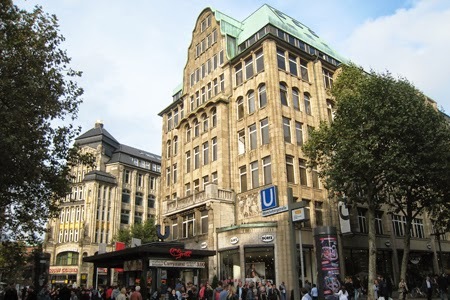 Like most redevelopment schemes in Hamburg it is resolutely mixed use. If you approach via the new shops and apartments with shiny cheap cladding fronting Hoheluftchausee, you will not be initially impressed. The new 13 storey offices with the top four rotated to create effect are meant to be the focus and are indeed effective in a clinical way. But what makes this development great for me is the retention and conversion of much of the former bus garage – nothing special as a building but giving character to the area. 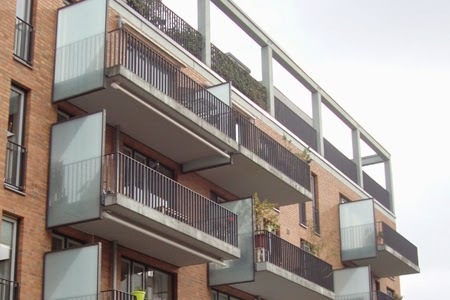 It has been converted to media studios and lofts, but maybe more importantly inspires attractive mews-type terraces and courts reflecting this light industrial ethic. This is an excellent example of ‘more city within the city’. The inner suburbs of Hamburg are full of interest. From Hoheluftbrücken U Bahn station follow Isestrasse, which could be Knightsbridge apart from the U Bahn viaduct up the middle of the street. 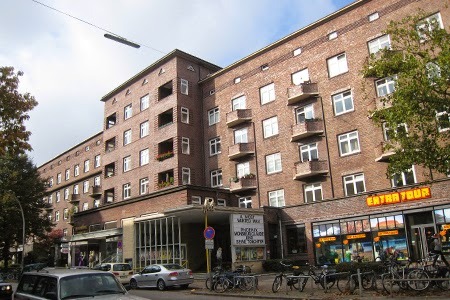 Next to the station is the Kunker Building, a random example of the quality of design from the Weimar period with lovely brickwork and sweeping, curved balconies. It incorporates shops and a cinema. Down Grindelberg are the remarkable modernist Grindelhochhäuser: 12 blocks of flats each 200m long and with majestic brick end elevations, all set in parkland. They were built in the early 50s and subsequently substantially refurbished, but with some nice period details surviving. 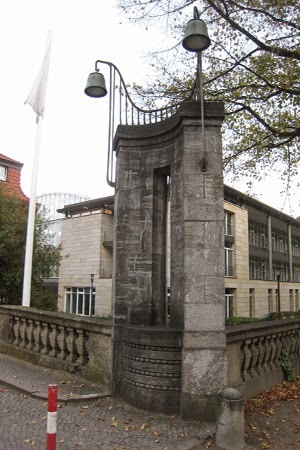 Nearby is the extensive University campus, which we did not have time to explore apart from the original 1919 building with its expressive detail like the concrete staircase balustrades. Across the road is the beautiful Jugendstil Dammtor station of 1903, a glass and steel palace. It is overshadowed by a towering Radisson hotel. Some mistake surely? 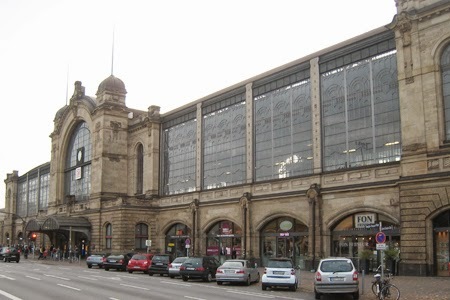 The vast 1906 Hauptbahnhof is much more masculine with a magnificently engineered train shed roof. 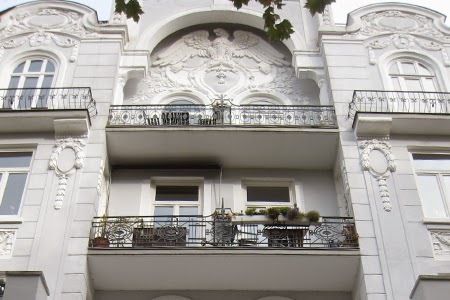 Its frontage is in a chunky Neo-Renaissance style. What disappoints is the crass advertising everywhere which humiliates the public spaces – so it’s not just Britain’s privatised railway companies who are guilty. What makes Hamburg so ‘blue’ is not just the Elbe with its many channels, the canals and extensive quaysides but the Alster lake right next to the city. This is reminiscent of Copenhagen, a relatively close neighbour and of course there are strong, not always entirely friendly, historic links between Hamburg and Denmark. The Binnen Alster and much larger Aussen Alster give style and elegance to a city centre which otherwise rather lacks this. The buildings are big in scale, not undistinguished but the busy shopping streets lack individuality. Quirkiness has largely been squeezed out by successive rebuildings, although there are more interesting streets, like Colonnaden. 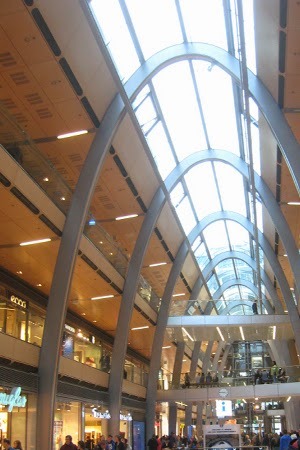 Most British cities would be delighted to have a shopping centre of the quality of Europapassage, designed by Bothe, Richter and Teherani, which is quietly understated and allows views out to the surrounding streets. The best bit of the city centre is the Alster Arcades, survivals from the post 1842 rebuilding and Jungfergstieg with some beautiful Nouveau buildings. 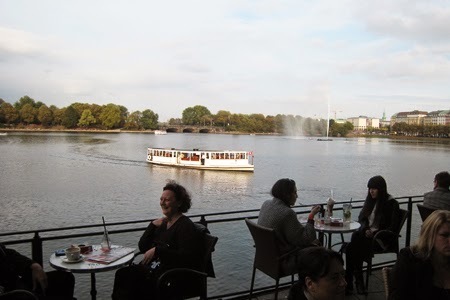 Jungfernstieg is right next to the Binnen Alster – except it isn’t. It is separated by a wide highway clogged by traffic. Why should this be in a city with such an excellent public transport system? 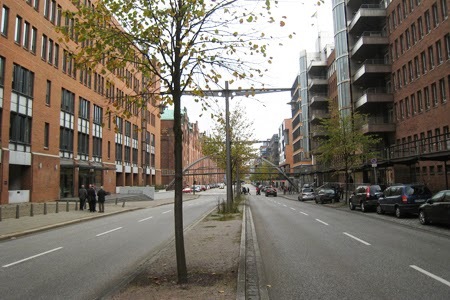 Hamburg still seems to be in love with cars in a way that its peer, Copenhagen, is not. Surely Jungfernstieg should be pedestrianised and reunited with the water. That would be really something. Hamburg really needs to learn about the ‘happy city’ from Copenhagen. 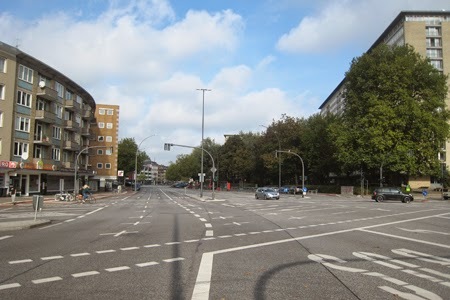 At present traffic is very dominant and the city centre is cut up with monstrous roads and speeding traffic, like Willy Brandt Strasse – not something he would have been proud of, surely. Cycling seems to follow the British model rather than the Dutch or Danish. It is growing in popularity and there are quite comprehensive cycle lanes but they have mostly been carved out of pedestrian space, not road space, setting up conflicts with pedestrians. I was nearly wiped out (literally) whilst admiring the Dammtor Station by a testosterone-fuelled cyclist jumping a red light London style. And the irony is that with all these wide roads there is masses of room for wide, civilised cycle lanes and pedestrian boulevards to calm the damned traffic Danish style. 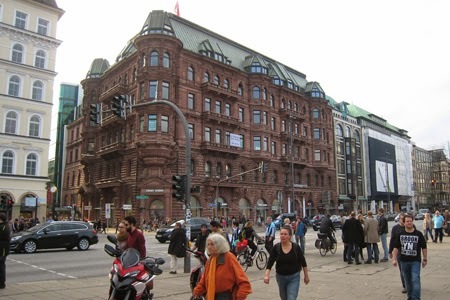 From HafenCity you have to cross Willy Brandt Strasse by subway to reach the very best thing in Hamburg, the Chilehaus. 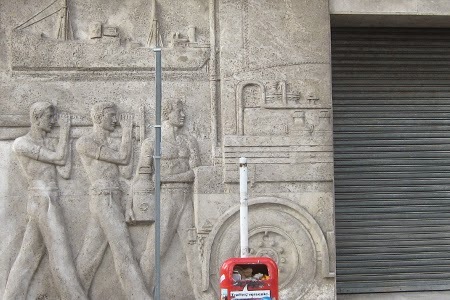 This is a truly knock-out Expressionist office and warehouse completed in 1924 and regarded as one of the architectural wonders of the world. As Eric Parry wrote in a BD article: ‘Chilehaus captures an extraordinary vital moment in German culture (and) has a terrific sense of the optimism and renewal of the time that proved all too brief …. (it) has a potent sense of the spirit of mercantile voyaging. 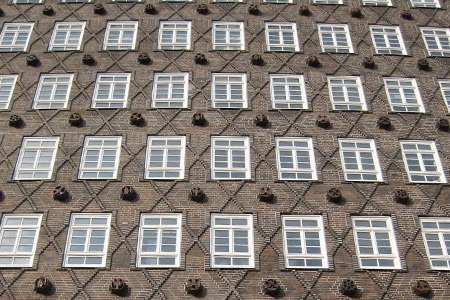 Chilehaus was designed by Fritz Höger, who came from a building craftsman’s background steeped in the Hanseatic tradition of brickwork.’ And that brickwork is utterly superb. That wonderful curved prow illustrated in so many books does not disappoint, although my photos of it do. 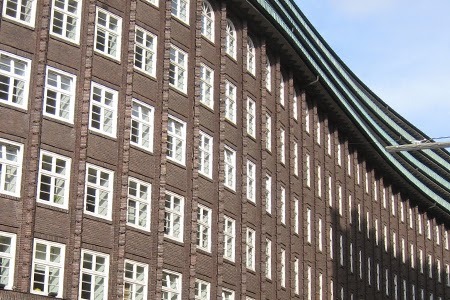 The building is a vast complex, far bigger than I had expected and is part of a bigger district of superb brick offices and warehouses including later examples like the Sprinkenhof. The Chilehaus alone makes a trip to Hamburg worthwhile but there is so much to see and to learn, far more than could be accomplished in a few days. What I took from the trip was how cities are about far more than the buildings. In HafenCity a lot of effort has gone into the quality of the architecture and public spaces, but as yet it lacks the spark of city life. Schanzenviertel where we stayed was overflowing with urban vitality, although the architecture while friendly was of no consequence. But the streets really worked, the buildings were evidently cheap and flexible, mixed use was not a problem. Like Shoreditch this just happened, a happy conjunction of opportunities. You can’t make it to order. And cities need both ambitious regeneration as well as creative, alternative quarters. 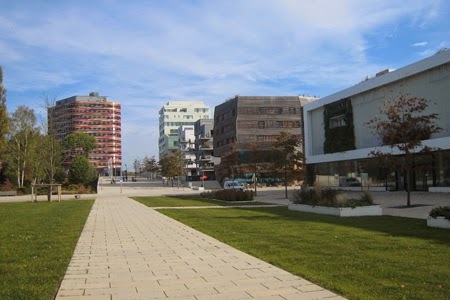 But maybe HafenCity is too planned and needs more opportunities for individualism, experimentation and the unexpected?